Yak & Yeti located in Animal Kingdom’s Asia between Flights of Wonder and Kali River Rapids. It’s an interesting 2 story purple building in which you can’t really get an idea of what it looks like until you enter. 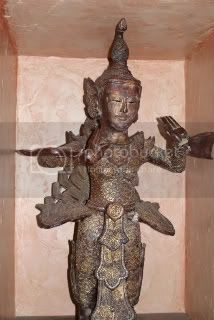 The Asian inspired restaurant is filled with pictures, large statues, unique chandeliers and beautiful wooden tables and chairs. This well air-conditioned restaurant is a great refuge from the humid heat of Orlando. We were seated in a room that was nice and quiet which is unusual in a park filled with people. Our server Nicole seemed a less than enthusiastic about being at work but that didn’t stop us from having a 3 course meal. 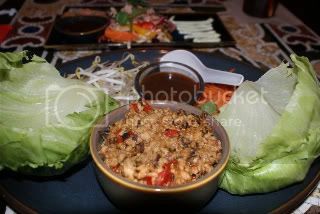 I started off with the Lettuce Cups with are served with seasoned minced chicken, bean sprouts, julienne carrots, crisp iceberg lettuce cups and a sweet maple tamarind sauce. This is a large appetizer and great for sharing. My husband ordered the Seared Ahi Tuna. 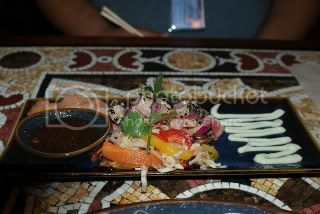 It was chilled, sesame encrusted ahi tuna served with a sweet chili slaw (carrots, peppers, onions and cabbage), wasabi aioli, chili sauce and pickled ginger. Both appetizers were very refreshing and great choices on a hot day. 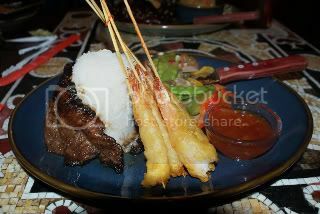 For my entrée I had the Shaoxing Steak and Shrimp - skirt steak and tempura fried shrimp served with jasmine rice, stir-fried vegetables and chili plum dipping sauce. The steak was cooked perfectly. It wasn’t overdone and chewy like skirt steak can be if it’s not cooked just right. The chili plum sauce was a great accompaniment to the shrimp. As for my husband he had the Baby Back Ribs. 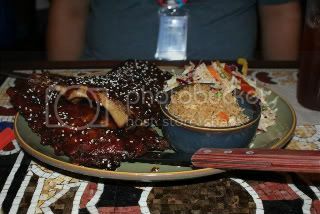 A full slab of slow roasted ribs smothered with hoisin BBQ sauce and served with a side of chicken fried rice and sweet chili slaw. It was a HUGE portion. It could have easily been shared between two people. For dessert we ordered the Mango Pie topped with whip cream and served with strawberries and mango then drizzled with raspberry and mango sauce. 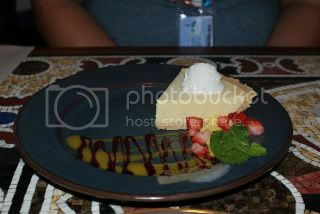 It was a chilled dessert, served nice and cold which was great on a hot day. 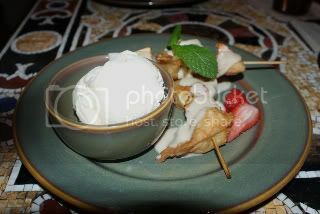 We also had the Fried Wontons which were skewers of fresh pineapple and cream cheese wontons drizzled with a honey vanilla sauce and served with a side of vanilla ice cream. The wontons and honey vanilla sauce were delicious. The vanilla ice cream was your everyday variety of plain vanilla ice cream. Nothing special like vanilla bean or french vanilla and I could have done without it. Honestly I left this place completely stuffed which is never a good thing when you have FastPasses for Expedition Everest. However the food was wonderful and full of flavor. The portions were definitely large enough for two people to share. A great restaurant to go to if you are trying to make your dollar go a little farther or stretch out the Disney Dining Plan so that you can have another dining credit to use elsewhere. Definitely a restaurant that I will be visiting again and most likely on my next trip to the World.